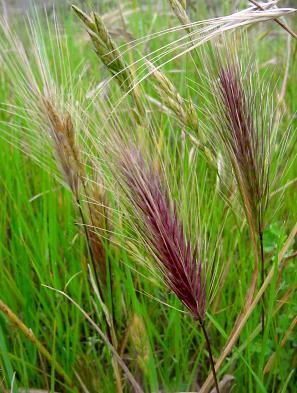 Foxtail barley, Hordeum jubatum, a weedy species found in northern North America and northeast Asia. Photo by Colin Stone. Hordeum is a genus of thirty or so species (Blattner, 2009, lists 33) whose native range mostly covers Eurasia and the Americas though various species have been spread by humans pretty much throughout the world, either willingly or unwillingly. The most significant of these species from a human perspective is Hordeum vulgare, barley, used in the making of refreshing beverages and the manufacture of eyewear. This is the genus that gave us beer. Six-rowed barley, Hordeum vulgare, the main cultivated variety of barley. Hordeum species bear single-flowered spikes in groups of three but usually only the central spike develops a seed while the lateral two are abortive. 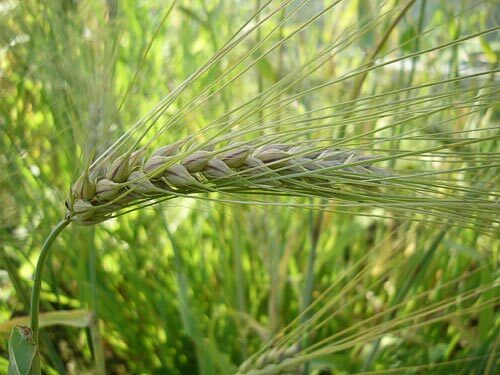 Six-rowed barley has been bred so all three develop seeds. Photo from here. Hordeum is one of the more basally diverging genera in the grass tribe Triticeae, previously discussed here in relation to the genus Elymus. Unlike many other triticean genera, the concept of Hordeum has remained relatively stable with the exception that some authors have restricted Hordeum to the species H. vulgare and H. bulbosum, placing the other species in a genus Critesion. Blattner (2009) divided the genus into five sections, four monophyletic (sensu Ashlock, at least) sections corresponding to the four genome types found in Hordeum (see the Elymus post for an explanation of the concept of genome types) and an explicitly polyphyletic section Nodosa for species derived from hybrids between species of sections Marina and Stenostachys. Hare barley, Hordeum murinum ssp. leporinum, native to Europe but widely established around the world. Photo from here. 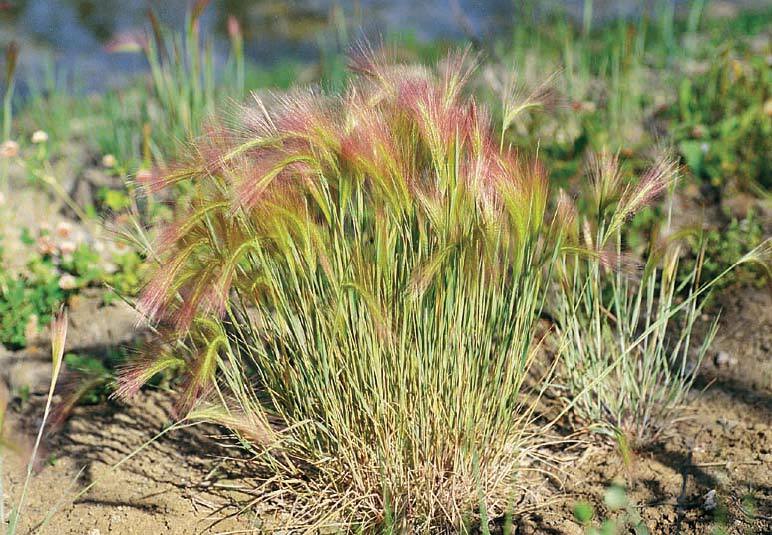 Hordeum is most diverse in the Americas - 24 species are found naturally in the New World (including two, H. brachyantherum and H. jubatum, that are also native to northeast Asia) with 15 of those native to South America. However, phylogenetic studies show that the genus is in fact Eurasian in origin with all of the New World diploid species belonging to a subclade of a single section (Stenostachys) which probably arrived in North America about four to six million years ago (Blattner, 2009). A number of the polyploid New World species (including both the Bering Strait-straddling species) appear to be derived from hybrids between New World Stenostachys and one of the central Asian Stenostachys species, probably H. roshevitzii - my guess is that they form a tribute to the ability of pollen to be carried amazingly long distances. Also biogeographically interesting are the section Nodosa species, the European H. secalinum and the South African H. capense. Hordeum secalinum appears derived from a cross between the mostly Mediterranean section Marina and a Stenostachys species (the ranges of the two sections overlap in central Asia). Hordeum capense is a biogeographical enigma; geographically isolated from all other species, it carries the same genome combination as H. secalinum (Baum & Johnson, 2003; Blattner, 2009) with which it is morphologically almost identical. Indeed, for a long time H. capense was regarded as a human-introduced population of H. secalinum, probably brought over in the earliest days of European colonisation. However, hybrids between H. secalinum and H. capense are infertile (Baum & Johnson, 2003). Petersen & Seberg (2004) calculated that the genetic divergence between H. secalinum and H. capense was too great for it to be a recent derivative of a human introduction; instead, they felt it must be an older relict that had reached South Africa by means unknown. Baum, B. R., & D. A. Johnson. 2003. The South African Hordeum capense is more closely related to some American Hordeum species than to the European Hordeum secalinum: a perspective based on the 5S DNA units (Triticeae: Poaceae). Canadian Journal of Botany 81: 1-11. Blattner, F. R. 2009. Progress in phylogenetic analysis and a new infrageneric classification of the barley genus Hordeum (Poaceae: Triticeae). Breeding Science 59: 471-480. Petersen, G., & O. Seberg. 2004. On the origin of the tetraploid species Hordeum capense and H. secalinum (Poaceae). Systematic Botany 29 (4): 862-873. ...used in the making of refreshing beverages and the manufacture of eyewear. Oh, no . . . it reminds of my yard. I should "harvest" those crops.